According to the U.S. Energy Information Administration (EIA), 95% of single family homes contain a clothes washer, 92% have a clothes dryer, and 74% have a personal computer. Among these people, how many of them do you think know the amount of energy each appliance is using? Do you know how much energy your appliances use, and how much each one is costing you? A power analyzer, also referred to as a power meter, is a tool designed to monitor appliances and provide reports on their energy usage as well as costs. 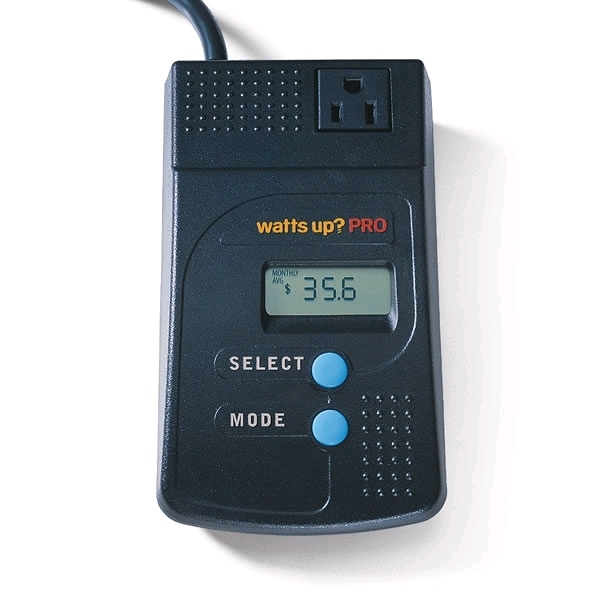 The Watts Up Pro Power Meter is an electricity monitor, watt meter, and power analyzer. Using this device is as simple as plugging it in, plugging an appliance into it, and turning the appliance on. It comes with a USB cable to be hooked up to your computer for analyzing after collecting data. This power meter will work for all electrical appliances that use a lot of energy, such as a microwave, wall air conditioner, or refrigerator. For an appliance as costly as a refrigerator you may worry that you don’t need a more energy efficient model or that getting one would take too long to pay for itself. The power meter also has a payback calculator. This estimates the amount of time it will take for a more energy-efficient model to essentially pay you back, helping you then decide the best move to make regarding that appliance. You may be shocked to discover how much energy you’re using as well as how much you could be saving. A power analyzer is a wonderful tool to help you start saving energy and cutting costs.